Well, it has been brought to my attention that I have not been doing my blogging duty. I am hoping that someday I will be able to get Rich to help out on here. . .but that might be wishful thinking!! Things have been going well albeit busy with the Hoffmans. Ben is crawling all over now and has decided that discovering what things invoke a "No, No, No" is far more fun that all the cool new toys he has received for Christmas. This keeps us busy (and makes sitting at the computer with my back to him, impossible). Elizabeth's new passion is "formsense", which to us lay people means "performance". She has her audience sit on the stairs (which is usually Mom and Ben) and she dances, sings (about 3 octaves too high), and plays the piano. I do have a video of this and if I can figure the video thing out, I will have to share it with you. I had to prep Rich NOT to laugh at the video as it was a very serious performance in Elizabeth's mind. Since I am not on my home computer - I am at lunch at work - I will include a few of my all time favorite pics that I have on this computer. . .
Rich's lovely ladies. . . and the duck. This is Ben at about a month old - he got so worked up in his car seat that he was soaked with sweat from head to toe. This is how his hair dried after cooling off. We found this hilarious! He looks like quite the baby rock star - perhaps we should start training him on guitar hero now. 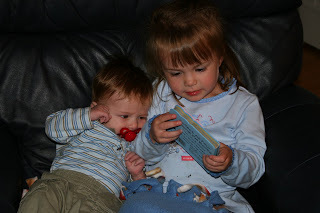 This is just a picture I love of them reading together. They are too cute. They still get along well. Elizabeth is still often too rough but she rarely does anything that isn't intended as love -- unless he goes after her stuff! :) You'd never know it, but babies can choke on dress up dresses - just ask Elizabeth. Happy Birthday to Austin Poleshuk tomorrow!